J-Mods In Pink Skirts - Times :: Tip.It RuneScape Help :: The Original RuneScape Help Site! The start of 2009 was a very interesting start for a new year of Runescape. With a new CEO, Mark Gerhard (Mod MMG), came a new lease of life to Runescape - and a very different one at that. Most people are aware that Jagex designated this year to be the Year of Upgrades, but also this year has shown a marked increase in the openness and Community involvement that Jagex have both inside and outside of the Runescape game. One of the first instances of Jagex becoming more open with players was the series of Question and Answer sessions in February. These covered general Runescape and Wilderness & Real-World Trading. I think some people were a bit disappointed that they didn't reveal much information about future updates, but the Q&A sessions, the ones back in February and more recent ones, show a willingness to communicate and create a dialogue between Jagex and the players. The Runescape Official Forums, while disliked by many people, are at the forefront of communication between Jagex and Runescape players. Since the start of 2009, Jagex has made the forums more accessible and have catered more to what the players want. One of the first changes was the re-opening of the Rants forum. Jagex said that they 'genuinely want to hear [our] feedback'. Of course there's no conclusive proof that any Jagex Moderators would listen to the posts in the Rants forum, but the Rants forum is what users wanted. Not long after this, Jagex opened up their forums to Free to Play members with over 12.5 Million total XP. While previously the forums were only open to paying Members, this move shows how Jagex wanted to hear the opinions of not only their Pay to Play members, but of Free to Play members also. Developer Blogs, posts by varying Jagex Moderators about updates and projects in development, were one of the next steps that Jagex have taken to become more open with their players. Early 2009 showed the end of Behind the Scenes, the monthly posts about content that was due to be released in the coming month, and Development Diaries (later to be renamed Developer Blogs), were mainly done as a replacement for that. Through these Diaries, we have learned quite a lot about Jagex. The way they develop updates, the way different parts of the team work and how people have jobs that we would never really hear about - yet are crucial to the game. For example, the series of Developer Blogs by Mod John A about the creation of the Quest 'Forgiveness of a Chaos Dwarf', from start to finish, gives us a lot of information about how Jagex create new content and the sorts of steps that new content goes through before we see it on our computer screens. Not all of this information is strictly 'useful' to a day to day player of Runescape, but to people who are interested in Jagex as a company, or game development, the Developer Blogs are fascinating. This year, Jagex has changed their stance on fansites, such as Tip.It. Previously, you could get yourself into trouble by saying the address of Tip.It in-game, but now (as long as you aren't spamming it wildly at the Grand Exchange), you can say Tip.It. It was an understandable stance, a lot of links that people are given in Runescape are to hacking websites that pretend to be the Runescape login page, but actually steal your password. But Jagex set up a 'white list' of Runescape fansites that follow the rules, for the first time accepting and acknowledging fansites. Along with this came exclusive content, such as concept art, and exclusive interviews. All the things mentioned so far, are steps that Jagex have taken to become a more transparent company outside of the Runescape world, but what about the steps taken within the game? The Jagex Cup, hosted (as you might guess) by Jagex, was a major stride in the relationship between Jagex and Clans. 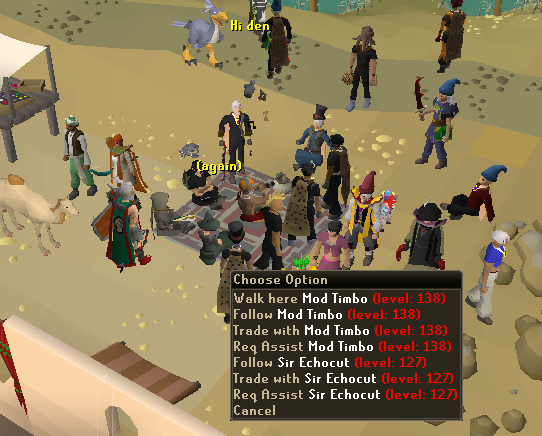 While not everybody joins or is interested in Clans, they are a large part of how the Runescape community functions. Of course, The Jagex Cup didn't run perfectly, and there was room for improvement, but it was the first attempt of its kind by Jagex. Another thing is Jagex's involvement in game events. Many events that are set up by Runescape fansites, such as those by the Tip.It Events Team, are attended by Jagex Moderators. Contrary to how they used to practically ignore such events, they now actively participate in and encourage these things. These are just some of the ways that Jagex have become, or at least tried to become, more open with players and showing that they aren't the silent monster of a company that they might have seemed to be a few years ago. And I'd like to leave you with a picture of Mod Timbo, attending one of our own Tip.It events, in a very fetching pink skirt! of Mod Timbo at a TET event in a pink skirt!